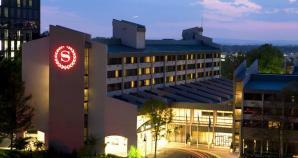 A warm & inviting hotel overlooking Reston National Golf Course. 301 spacious & comfortable guest rooms that feature Sheraton's "Sweet Sleeper" bedding. 18 flexible meeting rooms, most with natural light & garden views, accommodate groups of 5-500. Located near Dulles International Airport, corporate offices, Reston Town Center, world-class shopping, and historic attractions - the hotel is an excellent choice for all travelers to the DC area. Outdoor pool, fitness center, restaurant & lounge. Pet Restrictions: 1-2 dogs, 40lbs or 70lbs maximum for 2 dogs. Additional Metro Info: Sheraton Reston Hotel is only a quick complimentary shuttle ride away from the Silver Line Metrorail Stop, providing our guests with a short direct train ride into Washington, D.C. Stops along the way allow for easy access to Tysons Corner Center (a nearby shopping destination with plenty of dining and entertainment options), the Smithsonian, US Capitol, and Foggy Bottom, Metrorail’s closest stop to the historic Georgetown neighborhood.